This article is about the quest. For the dragon, see Paarthurnax (dragon). Deal with a potential threat. Talk to Esbern or Delphine. Tell them Paarthurnax is dead. This quest is given to you concurrently, or after The Fallen if you talk to Delphine or Esbern. Esbern - After you complete Alduin's Bane and defeat the World-Eater in combat, you may consult with Esbern to learn of Alduin's whereabouts. This begins the quest. Delphine – If you have not yet spoken with Esbern or Delphine at Sky Haven Temple, when the Season Unending conference is held, Delphine will approach you and start the quest automatically. You can avoid her if you exit the conference room quickly. If you do get stopped by her, you can refrain from making any selection and wait for the dialogue box to disappear and then leave. If you have finished the Civil War questline, Season Unending won't be triggered. Delphine and Esbern have discovered that Paarthurnax is the Master of the Greybeards and an ancient enemy of the Blades. You can argue in Paarthurnax's defense, but both will reiterate the war crimes and atrocities committed by Paarthurnax. In addition, Delphine thinks that his betrayal of Alduin actually makes him worse, because it could mean that he might betray the Dragonborn in turn. They will tell you that their oaths as Blades prevents them from giving you any further help until you kill Paarthurnax. If you go to Arngeir and tell him that the Blades want Paarthurnax dead, he will tell you that - although what Esbern said is true - it was because all dragons were in league with Alduin at first, and that Paarthurnax could not help it. He will go on to say that Paarthurnax did eventually rebel against Alduin, and was instrumental in Alduin's first demise. You are given the option to tell him that Paarthurnax must die or that you are going to spare the dragon. This will affect the conversation between Delphine and Arngeir if you are forced to negotiate a treaty in Season Unending. Alternatively, you can go to Paarthurnax at the Throat of the World. He acknowledges that all dragons thirst for dominance and that the Dragonborn shares this thirst, though he believes that he has overcome this predisposition through the sheer power of will and that he can be trusted. Paarthurnax is an easy foe for those who are leveled sufficiently, comparable to the average Frost dragon. You will receive a dragon soul and the usual set of dragon bones and dragon scales upon defeating him. Killing Paarthurnax will enrage Arngeir; if you return to High Hrothgar, he will angrily lecture you on your decision and even go so far as to threaten violence if you do not leave. After this, the other Greybeards will also fail to acknowledge you. On the other hand, the Blades will talk to you again. Arngeir retracts the Greybeards' hospitality, and it is no longer possible to ask him for the locations of word walls. Paarthurnax will no longer be around to provide meditation bonuses to certain shouts. If you already have a bonus, it will not go away; you will just be unable to change it. Taking anything from High Hrothgar will count as stealing. The Blades will welcome you once again and support you on Dragon Hunting missions. Arngeir will still disclose the location of word walls. Paarthurnax will still provide meditation bonuses for shout words. Paarthurnax will appear for an extra cutscene after Alduin's defeat, wherein he details his plans to rein in the dragons and teach them to live peacefully, following the Way of the Voice. This does not make gameplay any different — some will attack, and some won't, unless you attack them. After this, the quest will disappear from the journal. Taking anything from Sky Haven Temple will count as stealing. Removing items from some containers in the Sleeping Giant Inn will count as stealing, and you will lose access to the free bed there. If you have not brought three people to the Blades already, Delphine's recruitment quest will remain uncompleted, or will become unavailable if you have not started it. However, it is entirely possible to recruit three followers for Delphine before being given the quest to kill Paarthurnax. If you have not already obtained the potion from Esbern's Dragon Research, you will be unable to do so. In order to get the potion, you must do so between the quest Alduin's Wall and reading the Elder Scroll step of Alduin's Bane. The only real consequence of not killing him is no longer having dialogue with both Delphine and Esbern, and thus no longer having the option to go on Dragon Hunts with your recruited Blades. They still, however, act like regular companions - but of course, can only accompany you one at a time, like any other companion, rather than all three at once on a specific dragon-hunt. The Blades do not reward you upon your return after killing Paarthurnax. Most of the gains come from the varied loot you find when searching Paarthurnax upon his death. Because Delphine and Esbern are always essential characters and cannot die it is not possible to kill them to protect Paarthurnax. As there is no way to actually reject the quest (aside from ignoring the Blades), once this quest is started, there is no turning back. If this quest is obtained during the main questline and is not completed prior to finishing the main quest, it will disappear from your active quests. However, you may still kill Paarthurnax at any time after this point; the quest will now reappear in your journal and can be completed normally. These negative effects on Greybeards side are added at stage 50 (normally completed by killing Paarthurnax). If you use command setstage MQPaarthurnax 100 before killing him, you can benefit from both sides like before obtaining this quest. 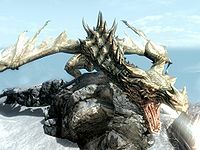 It is unclear why, but Paarthurnax's health will sometimes regenerate, making it impossible to kill him. At what point in the game the regeneration begins and ends remains to be determined. It is possible to bypass this bug by attacking Paarthurnax with Mehrunes' Razor. Fast traveling away and back when Paarthurnax's health meter is empty may trigger Paarthurnax's death. Ordering a follower to attack Paarthurnax may circumvent this bug. Often, Delphine will still allow you to recruit followers even after you have been told to kill Paarthurnax. Therefore, it is perfectly possible to complete that quest and not kill him. If you trigger the quest to kill Paarthurnax after completing Sovngarde, the quest will be permanently stuck in your journal unless you kill Paarthurnax. Even after killing Paarthurnax the misc. quest "Talk to Esbern" may remain stuck in your journal. 20 Delphine and Esbern have discovered that Paarthurnax was one of Alduin's chief allies during the ancient Dragon War. They refuse to give me any more help until I kill Paarthurnax. 50 Delphine and Esbern have discovered that Paarthurnax was one of Alduin's chief allies during the ancient Dragon War. I killed him, as they requested. The following empty quest stages were omitted from the table: 10, 15, 30, 150. On the PC, it is possible to use the console to advance through the quest by entering setstage MQPaarthurnax stage, where stage is the number of the stage you wish to complete. It is not possible to un-complete (i.e. go back) quest stages, but it is possible to clear all stages of the quest using resetquest MQPaarthurnax. This page was last modified on 8 January 2019, at 21:24.